Submitted by Symphony on 2018-08-15 12:17. This is a collection of override files packaged as haks designed to compliment the Arelith Changes overrides with graphical upgrades. This is an evolving project, with expected updates every few weeks. The first layer, named ar_gfx.hak, will be published content that could be considered somewhat "official". This will be tested and appreciated upgrade content that seems to be free of fixable bugs and performance issues, and is suitably compiled and encoded for distribution. The second layer, ar_gfxtest.hak will be publish candidate materials that seem to be ready to use, but should be tested and possibly modified after receiving large amounts of use. They may also be in raw formats and may not perform as well until they are compiled. Some of these materials may not "make the cut" after testing, and may end up being deleted from this layer without being promoted to "published", thus removing them from the game entirely. The use of this hak displays several lines of text at the top left corner of the "Legal Splash Screen" displayed just before the main NWN game client menu. This text indicates the version date in current use. The third layer, ar_gfxxxx.hak will be "experimental" content, where I will be auditioning high quality high impact materials, or materials whose working method may be sloppy or in need of improvement, but accomplish an impressive result. As with all layers, this layer will of course be optional and voluntary, but care should be taken before enabling. This hak also displays several lines of text on the "Legal Splash Screen", at the top right, indicating version date and current use. Either of these indicators can be used to confirm the proper configuration of the nwn.ini and userpatch.ini files. It is worth mentioning that all content on all of these layers, even the experimental ones, may require further testing and can cause performance issues and unpredictable gameplay, but none of them should crash your game, or cause any irreversible damage to your characters or your installation. If you have any reproducible crashes that seem to occur with the patch haks that do not occur without them, please inform me immediately, preferably in the Bug Reporting forum at Arelith.com. Some players may elect to find/request extra layers to stack on top of the rest of the collection. The flexibility of this patch hak system allows it, so if players want to "override the overrides" with other content, they are welcome to do so, in the event that they want to, say, replace all of the creepy crawly spiders in the game with large floating text that just says "Spider Here". It may also appeal to players using the Arelith Unofficial Portrait Collection to pack the portraits into a hak, and also put it somewhere in the list. It is also suggested that players in need of these packages also download the Arelith Changes override haks, and layer them below these graphics haks. Like the rest of the .ini's, which are essentially saved menu options, whether they exist in the game menus or not, the configuration of the patch haks is left to player preference. These graphics overrides are also available on the Steam Workshop, in three workshop items, but as overrides instead of hak format. Depending on other override subscriptions and override folder content, those subscriptions may not reliably inject these materials into the game, whereas the patch hak system will load all content and keep it loaded unless overriden by server haks. Originally published by the DLA team in the very early days of NWN as neck models (before there were wings, cloaks, and robes), this quiver model was originally created by NexusJnr and Astorax for the purpose of swapping neck models for neck models with quivers WHEN arrows existed in the ammo slot of the inventory. This scripted function has not been included, but rather these quivers now replace the base (full) quiver that comes with the game, as a back model. This will allow characters to have quivers and arrows that match their clothing colors, be advised that the colors are automatic, and you may want to change your armor colors with the quiver in mind, and use per part coloring to return individual pieces to what you prefer. The standard w_metal_tex.tga has been overridden with a 2k .dds with new, but similar coloring, as well as normal and specular mapping. This changes the looks of most of the weapons in the game, particularly bronze/silver/gold/adamantine weapon colors, handles, all four wood colors, the insides and edges of tower shields, and a variety of other models around the game which use the common resource. Barkskin, Stoneskin, Greater Stoneskin, Iceskin, and Shadowskin have all had their textures replaced with new diffuse textures. These textures are relative upgrades from the stock textures, but may be swapped in the future with shader driven character retexturing, with merged normal and spec maps. The mist placeable has been replaced with an alternative emitter that uses high resolution textures and birthrates, coupled with wind affectivity, gravity, and collision reactions. Due to the way the CPU driven emitters are ported to EE, this placeable is a high cost alternative, and may dramatically affect framerates, stack at your own risk. 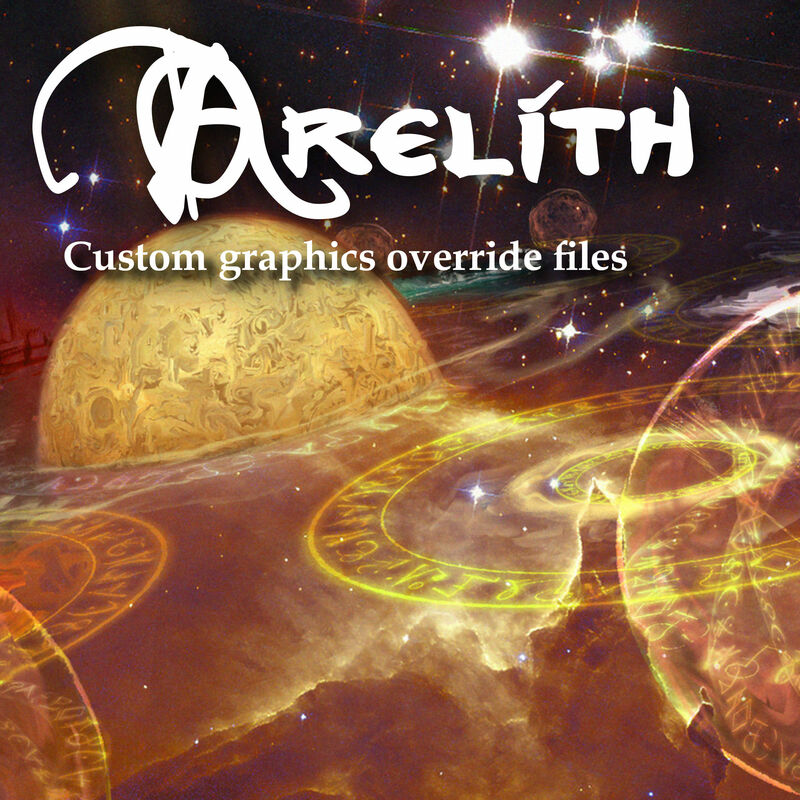 These files are on the Steam Workshop as overrides, as part of the Arelith Collection, a set of optional downloads designed to accompany the game data for playing on the Arelith server. Since these files are loaded on game start, these files may affect gameplay on non-Arelith servers, as well as offline gameplay. These files do serve as an accompaniment to the Arelith Changes, a set of overrides for playing on the Arelith server with the proper adjustments to weapons, weight, and other server changes. For questions, please post to the Arelith Forums.